You can use Squarespace Commerce to sell products, services or digital downloads on your website. You can also use Commerce to take donations, too. In addition, you can embed Amazon products in your web pages. In addition to the normal Products page, there are a number of other ways you can sell things on your Squarespace site. In this example, I have used a Product Block to highlight a particular product that I want to sell on this page. The product might be related to the topic of this page or blog post. Using a Product Block in this way is a nice way to promote specific items around your site or blog. This allows customers to quickly and easily make a purchase from anywhere, without needing to navigate to your products page. It's especially useful if you have a lot of products on your site, and want to promote products that might not be at the top of the product page. You can configure the Product Block in a number of ways: show or hide the image, description, price, quantity or Add to Cart button. You can put it in a column, increase/decrease the size, or wrap text around it, just like you can with any type of content block - like I am doing in this example. Notice how the text flows around the Product Block. Another way to highlight products on pages other than your Products page is to use a Summary Block that pulls a number of products from your Products page. In the below example, I have used the Carousel style of Summary Block to show a horizontal row of 3 products. You might consider putting something like this in the footer or bottom of your homepage. Feel free to play around with the above Donate Button - it's not hooked up to take payments, so you can try it without worrying about charges being taken off your card. Over on the right, I have used the Amazon Block to embed an Amazon product in the page. You can click the button to buy this album on Amazon (it's really good!). You can also use PayPal if you prefer not to use Squarespace Commerce, but you won’t get all the nice features like being able to track orders and manage inventory. If you already use BigCartel, Shopify or Etsy, you can import your products into Squarespace. This website accompanies the book, Building Business Websites with Squarespace, by Miko Coffey, published by Packt. This is a sidebar. It is a skinny column of content that you can put on certain pages of your site. Some templates allow you to put a sidebar anywhere; others only allow it on your blog. 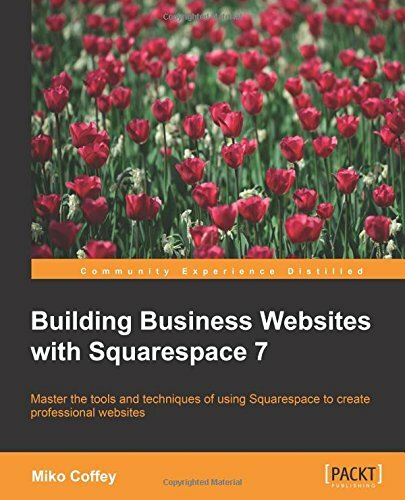 This site is a companion to the new book, Building Business Websites with Squarespace 7. Find out how you can buy the book. Miko Coffey is a freelance web consultant with over 17 years' professional experience with websites and online marketing. Need more help or ideas? Get the book for loads of step-by-step instructions and practical advice for business users of Squarespace. contact Miko about working together. © Copyright 2015-18 Miko Coffey, all rights reserved. Terms and conditions of this website, including info about privacy and cookies.